Nigerian artist Omotoyosi Ogunlende is working on a portrait of reggae music legend, Bob Marley, by running a thread through a grid of patterned nails hammered on to a board. “Basically what I did, or how I started this was I had… I took my board, from my board I had my picture of Bob Marley the legend, I traced it on the board. After tracing on the board, I nailed, after nailing then I coloured the background in three colours, you have the green, the yellow and the red which signifies the reggae colour or the Jamaican colour or the rastafarian colour, however anybody chooses to address it. 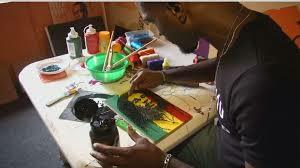 After nailing, colour background, after colouring the background then the stringing which actually brings out the actual picture of Bob Marley that we have here,” he said. Ogunlende studied fine art and sculpture at Yaba College of Technology, but started using string as a medium when he attended an art conference in South Africa last year. He has worked on 20 pieces since. “I ran into the stringing, not that it was actually there for display, I ran into stringing, I saw a young chap stringing on the wall, different colours all aligned together and I was like wow,” said Ogunlende. String art is not new in Nigeria, but Ogunlende says he is the only one doing portraits. He says his most popular pieces include notable Nigerian authors, Wole Soyinka and Chimamanda Adichie. Depending on the size, a portrait costs anything from 260 US dollars upwards, and can take him between two to three weeks to complete. “Since I started, the acceptance has been remarkable for me though, and based on the fact that I love what I do, I enjoy what I do, I have done some for free, I have done some for money and so far so good. It has paid off, really I am happy so far and I know there is a future for string art,” says Ogunlende. Ogunlende also teaches string art, which is also known as thread art to children over school holidays. He is also working on ways to incorporate string into metal works and sculptures.